Wolves have completed the signing of Scotland striker Steven Fletcher from Burnley for a fee of about £6.5m. The 23-year-old has signed a four-year contract, with the option for a fifth year, after a season with the Clarets. Wolves chief executive Jez Moxey said the fee matched the amount spent on acquiring Kevin Doyle last summer. "Although we continue to stick to the policy of not disclosing specific fees, I can confirm that this move makes Steven our record signing," he said. "He was one of manager Mick McCarthy's main targets for the summer and - just like last season with Kevin Doyle - we were able to register our interest early and get the deal done." Shrewsbury-born Fletcher's performances for Hibernian and Scotland youth sides had led to him being scouted by Real Madrid before his move to Burnley for £3m last summer. He scored eight goals in 35 Premier League games for a Clarets side that suffered relegation straight back to the Championship. "He is a Scottish international who has been heavily scouted by our management and scouting team and is an excellent player whom, despite his relatively young age, already boasts plenty of experience at the top level in both England and Scotland," said Moxey. "We believe Steven's abilities and qualities will perfectly complement Kevin, Sylvan Ebanks-Blake and the other strikers already at the club and create some fierce competition for places up front next season." Fletcher moves in the opposite direction from Scotland team-mate Chris Iwelumo, who joined Burnley from Wolves for an undisclosed fee on Tuesday. Clarets manager Brian Laws had insisted that the acquisition of Iwelumo was not linked with Fletcher's possible departure and that he wanted both players at Turf Moor. 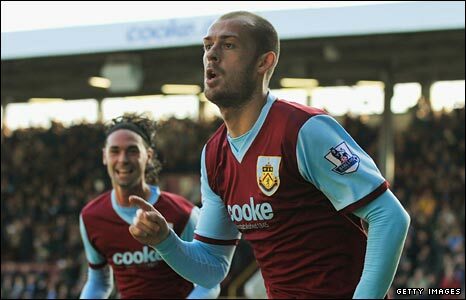 However, Fletcher's future at the club was always likely to be shortlived once Burnley's relegation from England's top flight was confirmed. Laws stressed that, should he lose the battle to retain the Scot, who scored 12 times in all for the club last season, he would seek another striker to replace him. "We need power and strength because the Championship is a very physical league, hence Chris's arrival," he told Burnley's website. "But I'm still looking for a goalscorer to complement my squad." Meanwhile, Iwelumo insisted that he was excited about a return to the Championship, having ended the season on loan to Bristol City after failing to become a first-team regular with Wolves in the Premier League. "It's going to be a good place to be and I think a very successful season," said the Coatbridge-born 31-year-old who started his career with St Mirren and had spells with Stoke City, Colchester United and Charlton Athletic before two years at Molineux. "It is a club with ambition and there will be lots of chances created and goals scored. "The Championship is a hard league to get out of, but the boys have the mentality to kick on and win a lot of games."